It’s that time of year again. Welcome to MCS “Awareness” Month! Barriers to access can be physical, attitudinal or systemic. Conveniences can also create barriers. If you are unable to remove a barrier to accessibility, consider what else can be done to provide services to people with disabilities. No-one should live without safe access to the necessities of life. Wireless Safety Standards… Safe For Who? That fragrance? It’s not fresh! Air Quality and Accessibility in Health Care; Why Aren’t All Health Care Providers Fragrance-Free? Conveniences that disable people or cause chronic illness and disease are NOT convenient for those who are injured by them, or for their friends and families. I don’t blame the people who buy and use the products, materials and devices that are causing health harms (unless they continue to use them after they’ve been asked not to), rather I blame the industries and the government reps who allow the harms to continue, long after enough evidence to show that significant harms to health exist. Remember the tactics of the tobacco industry? 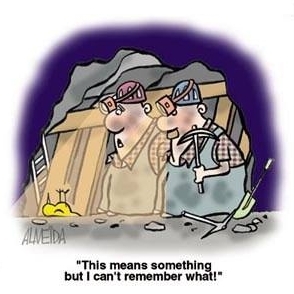 Petrochemical, wireless and other industries are using the same tactics to delay or eliminate regulations that would reduce easy profits, and bury their heads in the (legally constructed) sands regarding any damages to us that they may cause. See MCS Under Siege for some history… It’s long past time to move on. Too many people have been injured. Let’s prioritize each others health and well being over industry profits and do what we can to ensure future generations have a chance at a healthy life. Removing barriers to access means creating and enforcing policies to eliminate petrochemical fragrances and other unnecessary harmful chemicals and materials from indoor environments and products, as well as maintaining wired telecommunications networks instead of wireless, which now expose almost the entire population of the world to non-stop, electromagnetic fields and radiofrequency radiation exposures at levels with clearly established bioeffects, in a way never before experienced by society. Once a person is injured and develops MCS/ES, there is a need to get away from these exposures, as the daily exposures become debilitating. A growing number of people (including children) are affected in ways that increase with durations and quantities of exposures, but can subside so that people can function fairly normally when the sources of exposures are removed and the damages to brain and body processes can be treated. 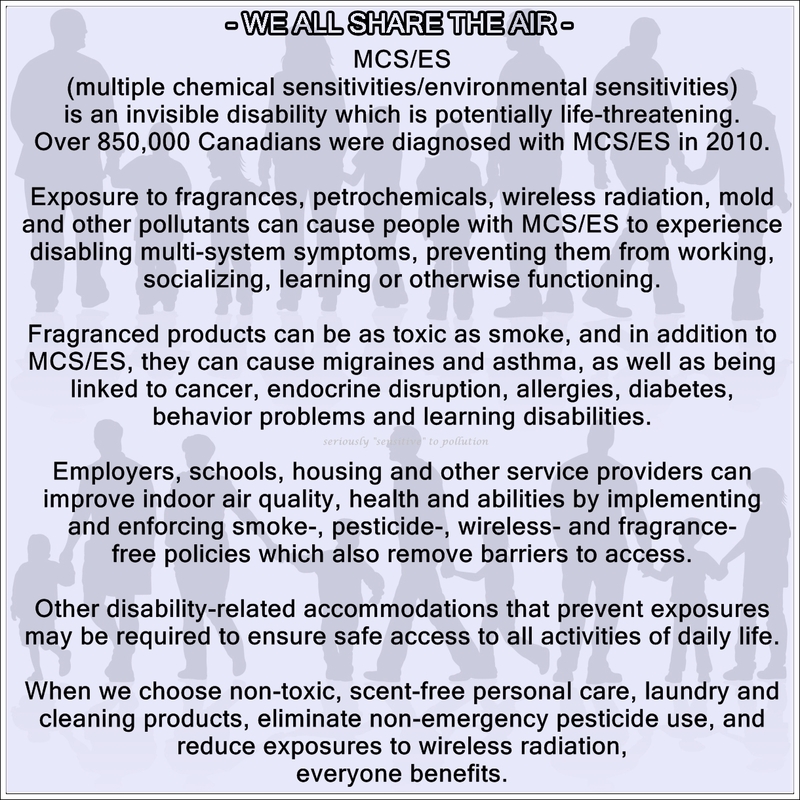 Creating and providing medically required healthy environments that are free of toxic and wireless trespass for people with MCS/ES, benefits everyone and harms no-one. These relatively simple steps also prevent currently healthy people from developing MCS/ES or other chronic, environmentally linked health conditions. Preventing exposures benefits everyone, not just those of us who detect the dangers before others do. This entry was posted in Accessibility, Disability, Environmental Health, Environmental Sensitivities, Human Rights, Multiple Chemical Sensitivities, Policy, Public Health and tagged EHS, health care, indoor air quality, MCS/ES, people with disabilities, petrochemicals, Removing barriers, wireless. Bookmark the permalink.